Long ears without black tips, long hind legs. Most rabbits are grey but in Kent there are variations towards brown/beige, and black (melanistic) animals are also quite frequently observed. They are traditionally found in the vicinity of hedgerows and along the edges of woods. Rabbits particularly favour hedges where there is a bank at the base that provides for burrows to be dug at a convenient angle. 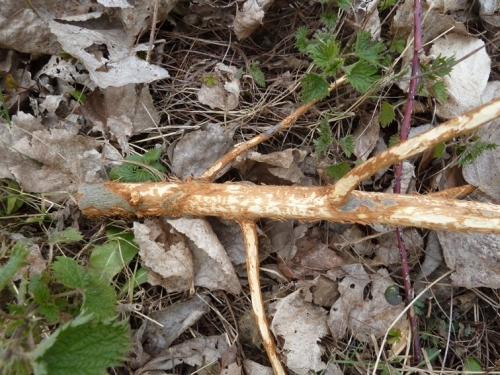 They are also found within woods and at a range of other habitats. In north Kent they rapidly colonised old industrial (brownfield) sites where the remnants of buildings and bramble cover provided favourable locations for burrowing. Along the coasts they are to be found living in sand dunes. On marshland they will dig into the sides of ditches. 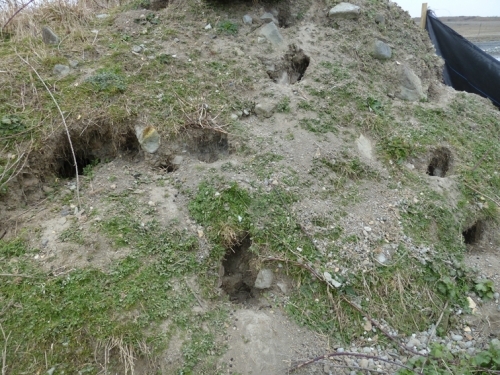 Rabbit burrowing has, at times, caused significant damage to railway embankments and secondary sea defences built of earth. The rabbit is a gregarious animal and where large numbers of burrows are excavated a warren is formed. Some of these have existed so long that the names are to be found on maps, as at The Warren, close to New Romney. There is a Kent Wildlife Trust Visitor Centre here and rabbits can be seen in the grounds. On the North Downs rabbit grazing is beneficial in maintaining the range of habitats on chalk grassland. 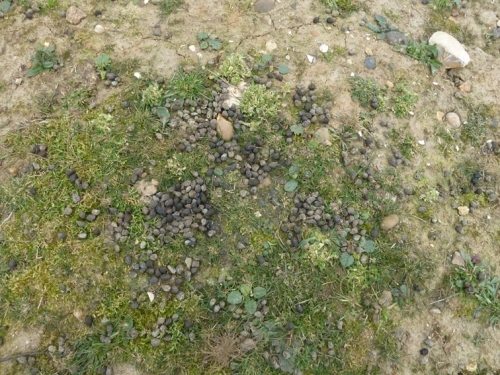 If burrows are found but rabbits are not seen the evidence of their presence may be shown by very close cropped grass, and latrine areas on bare ground with large numbers of small spherical droppings. The rabbit burrow is usually narrower than it is tall but this is not always the case and some burrows may be very large and might be confused with those made by badgers or foxes. 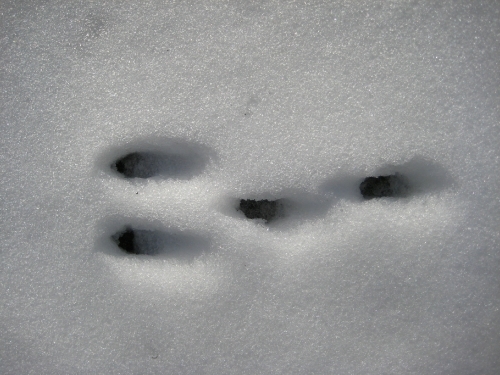 There may also be signs of recent excavation with large mounds of earth or sand, in which case look for the narrow channel and small footprints where the rabbit has kicked the soil back with its hind legs. In Kent the only other animal that might be confused with the rabbit is the brown hare. Although from a distance they may appear similar their respective habits are quite different, so by observing their behaviour they are not difficult to distinguish. 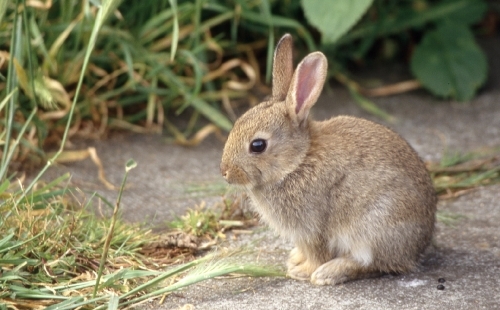 Rabbits usually graze in groups around the margins of fields or within easy range of safety. When disturbed they will run fast for cover showing the underside of their white tails. With their relatively short legs they appear to run low to the ground. The brown hare by contrast is a larger, longer eared, more solitary animal that usually grazes or lies low out in the middle of a large open field. When disturbed it will hop off on its long legs, quickly accelerating into a run that rapidly takes it into the distance. With its tail held down little of the white underside is visible. The rabbit is found in all parts of Kent with the exception of town centres and heavily populated suburbs. It is a common herbivore and is perhaps our most frequently observed wild mammal. A long walk in the country is exceptional if rabbits are not seen. 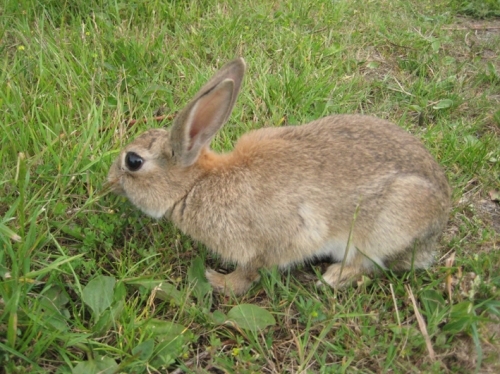 Rabbits have no legal protection in Britain and landowners are required to prevent them from damaging neighbouring land. Methods of biological control have attempted to reduce numbers i.e. the virus myxomatosis. Rabbit management continues using gassing, trapping, ferreting, snares, shooting and fencing.